The number of confirmed extra-solar planets has increased by leaps and bounds in recent years. With every new discovery, the question of when we might be able to explore these planets directly naturally arises. There have been several suggestions so far, ranging from laser-sail driven nanocraft that would travel to Alpha Centauri in just 20 years (Breakthrough Starshot) to slower-moving microcraft equipped with a gene laboratories (The Genesis Project). But when it comes to braking these craft so that they can slow down and study distant stars and orbit planets, things become a bit more complicated. According to a recent study by the very man who conceived of The Genesis Project – Professor Claudius Gros of the Institute for Theoretical Physics Goethe University Frankfurt – special sails that rely on superconductors to generate magnetic fields could be used for just this purpose. Starshot and Genesis are similar in that both concepts seek to leverage recent advancements in miniaturization. Today, engineers are able to create sensors, thrusters and cameras that are capable of carrying out computations and other functions, but are a fraction of the size of older instruments. And when it comes to propulsion, there are many options, ranging from conventional rockets and ion drives to laser-driven light sails. The sail he envisions would consist of a massive superconducting loop that measures about 50 kilometers in diameter, which would create a magnetic field once a lossless current was induced. Once activated, the ionized hydrogen in the interstellar medium would be reflected off the sail’s magnetic field. This would have the effect of transferring the spacecraft’s momentum to the interstellar gas, gradually slowing it down. One of the advantages of this method is the fact that can be built using existing technology. The key technology behind the magnetic sail is a Biot Savart loop which, when paired with the same kind of superconducting coils used in high-energy physics, would create a powerful magnetic field. Using such a sail, even heavier spacecraft – those that weight up to 1,500 kilograms (1.5 metric tonnes; 3,307 lbs) – could be decelerated from an interstellar voyage. In other words, such a system would not work for a nanocraft like that envisioned by Breakthrough Starshot. As Starshot’s own Dr. Abraham Loeb explained, the main goal of the project is to achieve the dream of interstellar travel within a generation of the ship’s departure. In addition to being the Frank B. Baird Jr. Professor of Science at Harvard University, Dr. Loeb is also the Chair of the Breakthrough Starshot Advisory Committee. “[Gros] concludes that breaking on the interstellar gas is feasible only at low speeds (less than a fraction of a percent of the speed of light) and even then one needs a sail that is tens of miles wide, weighting tons. The problem is that with such a low speed, the journey to the nearest stars will take over a thousand years. But for missions like The Genesis Project, which Gros originally proposed in 2016, time is not a factor. Such a probe, which would carry single-celled organisms – either encoded in a gene factory or stored as cryogenically-frozen spores – a could take thousands of years to reach a neighboring star system. Once there, it would begin seeding planets that had been identified as “transiently habitable” with single-celled organisms. For such a mission, travel time is not the all-important factor. What matters is the ability to slow down and establish orbit around a planet. That way, the spacecraft would be able to seed these nearby worlds with terrestrial organisms, which could have the effect of slowly terraforming it in advance of human explorers or settlers. Given how long it would take for humans to reach even the nearest extra-solar planets, a mission that last a few hundred or a few thousand years is no big deal. In the end, which method we choose to conduct interstellar mission will come down to how much time we’re willing to invest. For the sake of exploration, expedience is the key factor, which means lightweight craft and incredibly high speeds. But where long-term goals – such as seeding other worlds with life and even terraforming them for human settlement – are concerned, the slow and steady approach is best. One thing is for sure: when these types of missions move from the concept stage to realization, it sure will be exciting to witness! Forty years ago, the Voyager 1 and 2 missions began their journey from Earth to become the farthest-reaching missions in history. In the course of their missions, the two probes spent the next two decades sailing past the gas giants of Jupiter and Saturn. And while Voyager 1 then ventured into the outer Solar System, Voyager 2 swung by Uranus and Neptune, becoming the first and only probe in history to explore these worlds. This summer, the probes will be marking the fortieth anniversary of their launch – on September 5th and August 20th, respectively. Despite having traveled for so long and reaching such considerable distances from Earth, the probes are still in contact with NASA and sending back valuable data. So in addition to being the most distant missions from Earth, they are the longest-running mission in history. In addition to their distance and longevity, the Voyager spacecraft have also set numerous other records for robotic space missions. For example, in 2012, the Voyager 1 probe became the first and only spacecraft to have entered interstellar space. Voyage 2, meanwhile, is the only probe that has explored all four of the Solar System’s gas/ice giants – Jupiter, Saturn, Uranus and Neptune. Their discoveries also include the first active volcanoes beyond Earth – on Jupiter’s moon Io – the first evidence of a possible subsurface ocean on Europa, the dense atmosphere around Titan (the only body beyond Earth with a dense, nitrogen-rich atmosphere), the craggy surface of Uranus’ “Frankenstein Moon” Miranda, and the ice plume geysers of Neptune’s largest moon, Triton. But what is perhaps most memorable about the Voyager missions is the special cargo they carry. 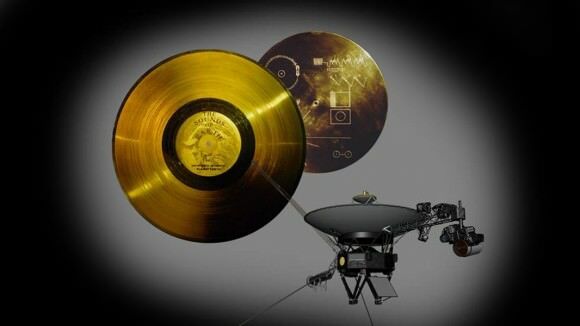 Each spacecraft carries what is known as the Golden Record, a collection of sounds, pictures and messages that tell of Earth, human history and culture. These records were intended to serve as a sort of time capsule and/or message to any civilizations that retrieved them, should they ever be recovered. As noted, both ships are still in contact with NASA and sending back mission data. The Voyager 1 probe, as of the writing of this article, is about 20.9 billion km (13 billion mi; 140 AU) from Earth. As it travels northward out of the plane of the planets and into interstellar space, the probe continues to send back information about cosmic rays – which are about four times as abundant in interstellar space than around Earth. From this, researchers have learned that the heliosphere – the region that contains the Solar System’s planets and solar wind – acts as a sort of radiation shield. Much in the say that Earth’s magnetic field protects us from solar wind (which would otherwise strip away our atmosphere), the heliopause protects the Solar planets from atomic nuclei that travel at close to the speed of light. Voyager 2, meanwhile, is currently about 17.7 billion km (11 billion mi; 114.3 AU) from Earth. It is traveling south out of the plane of the planets, and is expected to enter interstellar space in a few years. And much like Voyager 1, it is also studying how the heliosphere interacts with the surroundings interstellar medium, using a suite of instruments that measure charged particles, magnetic fields, radio waves and solar wind plasma. Once Voyager 2 crosses into interstellar space, both probes will be able to sample the medium from two different locations simultaneously. This is expected to tell us much about the magnetic environment that encapsulates our system, and will perhaps teach us more about the history and formation of the Solar System. On top of that, it will let us know what kinds of hazards a possible interstellar mission will have to contend with. Keeping the probes going has also been a challenge since the amount of power they generate decreases at a rate of about four watts per year. This has required that engineers learn how to operate the twin spacecraft with ever-decreasing amounts of power, which has forced them to consult documents that are decades old in order to understand the probes’ software and command functions. Luckily, it has also given former NASA engineers who worked on the Voyager probes the opportunity to offer their experience and expertise. At present, the team that is operating the spacecraft estimate that the probes will run out of power by 2030. However, they will continue to drift along their trajectories long after they do so, traveling at a speed of 48,280 km per hour (30,000 mph) and covering a single AU every 126 days. At this rate, they will be within spitting distance of the nearest star in about 40,000 years, and will have completed an orbit of the Milky Way within 225 million years. So its entirely possible that someday, the Golden Records will find their way to a species capable of understanding what they represent. Then again, they might find their way back to Earth someday, informing our distant, distant relatives about life in the 20th century. And if the craft avoid any catastrophic collisions and can survive in the interstellar medium of space, it is likely that they will continue to be emissaries for humanity long after humanity is dead. It’s good to leave something behind! The twin Voyager spacecraft are now making their way through the interstellar medium. Even though they are going where none have gone before, the path ahead it is not completely unknown. Astronomers are using the Hubble Space Telescope to observe the ‘road’ ahead for these pioneering spacecraft, to ascertain what various materials may lay along the Voyagers’ paths through space. The combined data is also providing new insights into how our Sun travels through interstellar space, and astronomers hope that these combined observations will help them characterize the physical properties of the local interstellar medium. “Ideally, synthesizing these insights with in situ measurements from Voyager would provide an unprecedented overview of the local interstellar environment,” said Hubble team member Julia Zachary of Wesleyan University. The initial look at the clouds’ composition shows very small variations in the abundances of the chemical elements contained in the structures. “These variations could mean the clouds formed in different ways, or from different areas, and then came together,” Redfield said. In this illustration, NASA’s Hubble Space Telescope is looking along the paths of NASA’s Voyager 1 and 2 spacecraft as they journey through the solar system and into interstellar space. Hubble is gazing at two sight lines (the twin cone-shaped features) along each spacecraft’s path. The telescope’s goal is to help astronomers map interstellar structure along each spacecraft’s star-bound route. Each sight line stretches several light-years to nearby stars. Credit: NASA, ESA, and Z. Levy (STScI). Astronomers are also seeing that the region that we and our solar system are passing through right now contains “clumpier” material, which may affect the heliosphere, the large bubble that is produced by our Sun’s powerful solar wind. At its boundary, called the heliopause, the solar wind pushes outward against the interstellar medium. Hubble and Voyager 1 made measurements of the interstellar environment beyond this boundary, where the wind comes from stars other than our sun. Both Voyagers 1 and 2 launched in 1977 and both explored Jupiter and Saturn. Voyager 2 went on to visit Uranus and Neptune. Voyager 1 is now 13 billion miles (20 billion km) from Earth, and entered interstellar space in 2012, the region between the stars that is filled with gas, dust, and material recycled from dying stars. It is the farthest a human-made spacecraft has even traveled. Next big ‘landmark’ for Voyager 2 is in about 40,000 years when it will come within 1.6 light-years of the star Gliese 445, in the constellation Camelopardalis. Voyager 2, is 10.5 billion miles (16.9 billion km) from Earth, and will pass 1.7 light-years from the star Ross 248 in about 40,000 years. Of course, neither spacecraft will be operational by then. But scientists hope that for at least the next 10 years, the Voyagers will be making measurements of interstellar material, magnetic fields, and cosmic rays along their trajectories. The complimentary Hubble observations will help to map interstellar structure along the routes. Each sight line stretches several light-years to nearby stars. Sampling the light from those stars, Hubble’s Space Telescope Imaging Spectrograph measured how interstellar material absorbed some of the starlight, leaving telltale spectral fingerprints. When the Voyagers run out of power and are no longer able to communicate with Earth, astronomers still hope to use observations from Hubble and subsequent space telescopes to characterize the environment where our robotic emissaries to the cosmos will travel. If we could board the starship Enterprise-D and were able to look through Giordi LaForge’s visor we might be able to see the interstellar medium – the ‘stuff’ between the stars — as wispy clouds of oxygen, hydrogen, helium and neon. Instead, since we are back in the 21st century, we have the Interstellar Boundary Explorer (IBEX) spacecraft, which has now made the first–ever direct observations of neutral hydrogen and oxygen atoms drifting into our solar system from the region outside our heliosphere. Surprisingly, this material is more ‘alien’ than scientists were expecting, as the matter in the galactic wind doesn’t contain the same exact material as what our solar system is made of. The most important finding is there is less oxygen ‘out there.’ For every 20 neon atoms in the galactic wind, there are 74 oxygen atoms. In our own solar system, however, for every 20 neon atoms there are 111 oxygen atoms. That translates to more oxygen in any given region of the solar system than in the local interstellar space. Either way, the scientists said, this affects scientific models of how our solar system – and life – formed. And more than just helping to determine the distribution of elements in the interstellar medium, these new measurements provide clues about how and where our solar system formed, the forces that physically shape our solar system, and even the history of other stars in the Milky Way. “This alien interstellar material is really the stuff that stars and planets and people are made of — and it’s very important to be measuring it directly,” McComas said during a press briefing on Tuesday. Interstellar clouds hold the elements of exploded supernovae, which are dispersed throughout the galaxy. As the interstellar wind blows these charged and neutral particles through the Milky Way, the spacecraft can measure samples that make it into our solar system. IBEX scans the entire sky once a year, and every February, its instruments point in the correct direction to intercept incoming neutral atoms. IBEX counted those atoms in 2009 and 2010 and has now captured the best and most complete glimpse of the material that lies so far outside our own system. In addition to sampling the raw “star stuff,” the findings are important because the interstellar gas surrounding us can affect the strength of the Sun’s heliosphere – the area of influence by the Sun, and like a shielding bubble, protects us from dangerous galactic cosmic rays, the majority of which would come into the inner solar system if not for this bubble. IBEX also discovered that the interstellar wind is approximately 7,000 miles per hour slower than previously thought. This indicates that our solar system is still in what’s referred to as the “local interstellar cloud.” However, the scientists noted that we will transition into a different region at any time within a few thousand years (very short on astronomical time scales) where conditions will change and affect the heliosphere’s protective capability. And no one knows if that change will be for the better or worse. Additionally, while the new findings provide a greater understanding of our heliosphere, it will also aid scientists in exploring analogous structures called “astrospheres,” surrounding other stars throughout the galaxy. IBEX is a small spacecraft, roughly the size of a card table, and is one of NASA’s low-cost missions. It is in Earth orbit, but can observe the edges of the solar system with detectors that “look” outward and collect particles called energetic neutral atoms. With data from IBEX, scientists are creating the first map of the boundary of our solar system. These latest findings from IBEX were presented in a series of science papers appearing in the Astrophysics Journal on January 31, 2012. *Thanks to Dwayne Brown from NASA for the Spock reference. Away in space some 4.57 billion years ago, in a galaxy yet to be called the Milky Way, a hydrogen molecular cloud collapsed. From it was born a G-type main sequence star and around it swirled a solar nebula which eventually gelled into a solar system. But just what caused the collapse of the molecular cloud? Astronomers have theorized it may have been triggered by a nearby supernova event… And now new computer modeling confirms that our Solar System was born from the ashes a dead star. While this may seem like a cold case file, there are still some very active clues – one of which is the study of isoptopes contained within the structure of meteorites. As we are well aware, many meteorites could very well be bits of our primordial solar nebula, left virtually untouched since they formed. This means their isotopic signature could spell out the conditions that existed within the molecular cloud at the time of its collapse. One strong factor in this composition is the amount of aluminium-26 – an element with a radioactive half-life of 700,000 years. In effect, this means it only takes a relatively minor period of time for the ratio between Al-26 and Al-24 to change. However, it would seem that a class of carbonaceous chondrite meteorites known CV-chondrites, have a bit more than their fair share of Al-26 in their structure. Is it the smoking gun of an event which may have enriched the cloud that formed it? Isotope measurements are also indicative of time – and here we have two examples of meteorites which formed within 20,000 years of each other – yet are significantly different. What could have caused the abundance of Al-26 and caused fast formation? While these two theories are great, only one problem remains… Distinguishing the difference between the two events. So Matthias Gritschneder of Peking University in Beijing and his colleagues set to work designing a computer simulation. Biased towards the supernova event, the model demonstrates what happens when a shockwave encounters a molecular cloud. The results are an appropriate proportion of Al-26 – and a resultant solar system formation. While there are still other isotope ratios yet to be explained and further modeling done, it’s a step toward the future understanding of how solar systems form. Original Story Source: MIT Technology Review News Release. For Further Reading: The Supernova Triggered Formation And Enrichment Of Our Solar System. Gamma Ray Bursts (GRBs) are among the most energetic phenomena astronomers regularly observe. These events are triggered by massive explosions and a large amount of the energy if focused into narrow beams that sweep across the universe. These beams are so tightly concentrated that they can be seen across the visible universe and allow astronomers to probe the universe’s history. If such an event happened in our galaxy and we stood in the path of the beam, the effects would be pronounced and may lead to large extinctions. Yet one of the most energetic GRBs on record (GRB 080607) was shrouded in cloud of gas and dust dimming the blast by a factor of 20 – 200, depending on the wavelength. Despite this strong veil, the GRB was still bright enough to be detected by small optical telescopes for over an hour. So what can this hidden monster tell astronomers about ancient galaxies and GRBs in general? GRB 080607 was discovered on June 6, 2008 by the Swift satellite. Since GRBs are short lived events, searches for them are automated and upon detection, the Swift satellite immediately oriented itself towards the source. Other GRB hunting satellites quickly joined in and ground based observatories, including ROTSE-III and Keck made observations as well. This large collection of instruments allowed astronomers, led by D. A. Perley of UC Berkley, to develop a strong understanding of not just the GRB, but also the obscuring gas. Given that the host galaxy lies at a distance of over 12 billion light years, this has provided a unique probe into the nature of the environment of such distant galaxies. One of the most surprising features was unusually strong absorption near 2175 °A. Although such absorption has been noticed in other galaxies, it has been rare in galaxies at such large cosmological distances. In the local universe, this feature seems to be most common in dynamically stable galaxies but tends to be “absent in more disturbed locations such as the SMC, nearby starburst galaxies” as well as some regions of the Milky Way which more turbulence is present. The team uses this feature to imply that the host galaxy was stable as well. Although this feature is familiar in nearby galaxies, observing it in this case makes it the furthest known example of this phenomenon. The precise cause of this feature is not yet known, although other studies have indicated “polycyclic aromatic hydrocarbons and graphite” are possible suspects. Earlier studies of this event have shown other novel spectral features. A paper by Sheffer et al. notes that the spectrum also revealed molecular hydrogen. Again, such a feature is common in the local universe and many other galaxies, but never before has such an observation been made linked to a galaxy in which a GRB has occurred. Molecular hydrogen (as well as other molecular compounds) become disassociated at high temperatures like the ones in galaxies containing large amounts of star formation that would produce regions with large stars capable of triggering GRBs. With observations of one molecule in hand, this lead Sheffer’s team to suspect that there might be large amounts of other molecules, such as carbon monoxide (CO). This too was detected making yet another first for the odd environment of a GRB host. This unusual environment may help to explain a class of GRBs known as “subluminous optical bursts” or “dark bursts” in which the optical component of the burst (especially the afterglow) is less bright than would be predicted by comparison to more traditional GRBs. Astronomers have created a new 3D map of the interstellar gas in the local area around our Sun. “Local” is a relative term, as the map extends to an area of 300 parsecs and provides new absorption measurements towards more than 1800 stars. The group of astronomers, from the US and France, were able to characterize the properties of the interstellar gas within each sight line. The new map will allow astronomers to better understand the interplay between the evolution of stars and their exchange of matter with the ambient interstellar medium. The local area around our Sun has been studied with many surveys at various wavelengths, but the whole picture is still far from being either complete or fully understood. Our sun resides in a “cavity” a region of very low-density neutral gas, known as the Local Cavity. Theories of the general interstellar medium require that these large rarefied cavities exist, and astronomers believe the cavities were formed by the combined action of energetic supernova events and the outflowing winds of clusters of hot and young stars. The history of our Local Cavity is still speculative, but astronomers think it was created about 15 million years ago by a series of supernova outbursts, with the last re-heating happening about 3 million years ago. The team gathered their data primarily from the European Southern Observatory in Chile, and combined it with previously published results. The map (shown above) shows the sodium map of the interstellar gas density within 300 parsecs. The white area surrounding the Sun (at the center of the map) corresponds to the Local Cavity. It is about 80 parsecs in radius in most directions and is surrounded by a highly fragmented “wall” of dense neutral gas. The various gaps in the wall are “interstellar tunnels” and represent rarefied pathways into other surrounding interstellar cavities. Maps of the distribution of calcium have never been made before, and they reveal that the Local Cavity contains numerous filamentary structures of partially ionized gas that appear to form in a honeycomb-like pattern of small interstellar cells.